Glasgow Clan coach Pete Russell says the loss of high-scoring forward Brendan Connolly has put "a downer" on his team finishing fourth in the Elite League standings. A suspected knee injury picked up in the 4-2 win away to Fife Flyers means the key player will miss their quarter-final against Guildford Flames - and for Great Britain in May. Flyers ended their regular season campaign with two losses from three as they set up a quarter-final affair with Nottingham Panthers. While Dundee Stars saw their play-off hopes dashed, missing out on a top eight in the end, but ended their campaign with a win over Guildford. Connolly's injury tempered his coach's joy as his side ended a seven-game losing run after reversing Saturday's defeat by Flyers. "It's not looking promising for Brendan," Russell said. "I don't want to say too much about the contact, but never mind playing for us next week, it doesn't look good for him in the national team in May. "It's put a real downer on the team and the guys were gutted to see that for him." But Russell was glad to get back to winning ways after reading the riot act to his players after Saturday's 3-2 defeat by the same opponents. "I've said before I didn't think we'd been playing badly," he said. "It was just the little things we weren't getting right, but I was pleased with the response. "Overall, we've finished fourth and we can be pleased with that, although it would have been nicer to be third." At Braehead on Saturday, Vaclav Stupka's opener for Glasgow was cancelled out by Evan Bloodoff before Zack Fitzgerald restored the home side's lead. Flyers drew level again through Brett Bulmer early in the third period before Bloodoff's second of the night proved enough to make it a good night for Flyers in Glasgow. In Sunday's rematch in Kirkcaldy, Jack Musil put the visitors in front and, after Connolly's injury sustained in the incident with Bulmer, Glasgow added two more on the powerplay through Tyson Wilson and Guillaume Doucet. Flyers hit back through Jordan Buesa and, after Glasgow restored their three-goal lead through Rasmus Bjerrum, Bloodoff struck to make it 4-2. The heavily depleted Flyers' busy weekend had started with a 7-0 whitewash away to a Belfast Giants side who have now been confirmed as Elite League champions. Manchester Storm's win over Milton Keynes Lightning on Friday ended Dundee's play-off aspirations, but they bounced in two good performances to finish their season. They ran champions Belfast close on Saturday, when two goals from Charles Corcoran and one each from Matt Marquardt and Jordan Cownie gave Belfast cause for concern at 4-4 until the final period. However, Giants added two more goals to secure a win. Stars finished off their season at Gulldford, edging a 4-3 penalty shots win after being 2-0 down before Marquardt, Brian hart and Drydn Dow found the net. 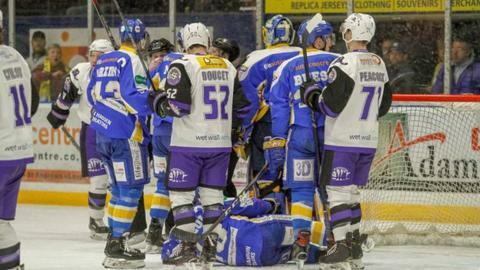 Glasgow Clan's win away to Fife Flyers ended seven-game losing run - and a seven-game streak away from home without a win. Evan Bloodoff's three goals against Glasgow, taking the Fife Flyer's tally against Clan to 17 goals and one assist in the last two seasons, scoring seven against them this season alone. Dundee Stars have missed the play-offs two seasons in a row.